As we age, the face loses volume resulting in a loss of definition and sagging of the facial skin. This is secondary to the loss of a combination of fat and bone. Restylane® Lyft is a facial dermal filler that is used to enhance the facial features. It can be used in patients that just want to improve their facial balance or by patients that have lost volume secondary to the aging process. Restylane Lyft is composed of hyaluronic acid, which is a naturally occurring substance in the human body. Restylane Lyft can be safely and effectively used by double board-certified facial plastic surgeon Dr. Jonathan Kulbersh to enhance the natural beauty of the face. How can Restylane Lyft Injections Improve Facial Features? When I look at the face for the evaluation of facial fillers, I am attempting to maximize the amount of light the face reflects, improve facial definition, and lift sagging facial features. The addition of Restylane Lyft to the face can achieve all of these results. 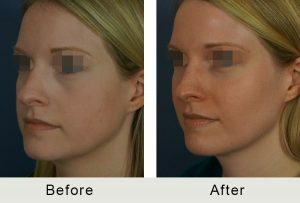 At my practice in Charlotte, Restylane Lyft can improve facial proportions allowing patients to look refreshed and appear younger. What is the Composition of Restylane Lyft? Restylane Lyft is a clear gel. It is composed of hyaluronic acid, a naturally occurring substance in one’s body. Juvéderm and Restylane Lyft are all made of hyaluronic acid. Where is Restylane Lyft Commonly Injected? 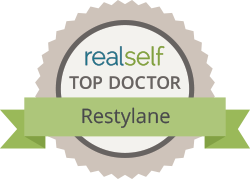 As a double board certified facial plastic surgeon in Charlotte, I can inject Restylane Lyft safely into multiple areas of the face. There are areas of the face that require more skill to inject secondary to the thinness of the skin and surrounding important facial structures (eye or blood vessels). Dr. Kulbersh takes all necessary precautions when injecting into these areas to ensure utmost safety and natural results. What if I Don’t Like the Result? Can the Injection be Reversed? Restylane Lyft is a great product because it can be easily reversed. There is an enzyme, hyaluronidase, which instantaneously dissolves the filler. For my patients in Charlotte, Restylane Lyft can be easily removed by a simple injection of hyaluronidase and the face will return to the pre-injection state. How Long Does Restylane Lyft Last? After Restylane Lyft is injected, it is slowly absorbed by the body. The rate of absorption will be a little different depending on location of the filler and the patient. Areas of the face that move more frequently (the mouth) will dissolve the Restylane Lyft faster than non-mobile areas (temples). Most patients like to have the area re-injected after 60% of the filler has gone away. Depending on the area of the face, this will be every 9-15 months on average. Do I Need the Same Amount Each Treatment? Since most people feel they need injections when 60% of the filler is dissolved, patients will not need the same amount each treatment. If 40% of the filler remains during a repeat treatment, the patient will need less filler to achieve the same result. 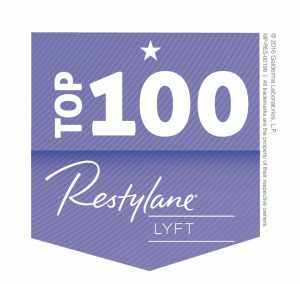 How Much Does Restylane Lyft Cost in Charlotte? At Carolina Facial Plastics, Restylane Lyft is priced out per syringe. Each syringe contains 1ml of product. Double board-certified facial plastic surgeon Dr. Kulbersh does injections at his office in Charlotte. The price of a syringe of filler at the office will range for $550 to $700. When multiple syringes are used, the sequential syringes cost less than the initial syringe. How Many Syringes Do Most Patients Require? The amount of syringes injected can depend on the amount of volume loss in the face and the patient’s goals. It can range from 1 syringe to over 20 syringes. What is the Needless Injection Technique Used to Inject Restylane Lyft in Charlotte at Carolina Facial Plastics? The majority of injectors use needles to inject fillers. Using a needle on the face can be painful, traumatic, and create a bruise. At Carolina Facial Plastics, Dr. Kulbersh uses a blunt tipped micro cannula to inject facial fillers. Since the micro cannula is blunt at the end, it causes less trauma, resulting in a more comfortable experience and less risk of a bruise for patients. Can I Be Allergic to Restylane Lyft? Restylane Lyft is composed of a naturally occurring substance in the body, and it has an extremely low incidence of a patient becoming allergic to the product. In my experience, I have never seen a patient that was allergic at my Charlotte practice. How Often Does Dr. Kulbersh Inject Fillers at Carolina Facial Plastics? Dr. Kulbersh is a leader in injectable fillers in Charlotte. He is currently one of the highest volume injectors of fillers in North and South Carolina. Can a Patient Have a Consultation and Injections on the Same Day? Of course! In order to make the experience convenient for patients, we commonly have a consultation and perform the injection on the same day. When scheduling your appointment, please let the receptionist know that you are interested in having the injection the same day. The receptionist can schedule time to allow Dr. Kulbersh to perform the injections. What is the Difference between Restylane Lyft and Perlane? There is no difference between Restylane Lyft and Perlane. The company that owns theses fillers changed the name of Perlane to Restylane Lyft in 2015. Why Should I Choose Carolina Facial Plastics to Have My Restylane Lyft Injections in North Carolina? When considering a medical professional to trust to inject a substance into your face, I would recommend choosing an expert. Dr. Kulbersh is a Beverly Hills fellowship trained and double board certified facial plastic surgeon. He has worked with the best injectors in Beverly Hills. Dr. Kulbersh is a facial plastic surgeon who performs facial fillers on a daily basis. Dr. Kulbersh uses the most recent and advanced techniques such as the micro cannula to limit downtime, improve safety, and create amazing results. How Can I Get My Restylane Lyft Injected By Dr. Kulbersh? Please call my office at (704) 842-3644, or fill out the online appointment form to schedule a consultation. During this time, we’ll be able to develop a completely customized treatment plan unique to your specific needs.